Dear Colleagues ! We are looking forward to seeing you in Berlin or remotely ! A session of the RDA plenary to share the conclusions of the pre-meeting and continue the discussion with eminent panellists. A joint session with other RDA groups to find out what they have already undertaken or done to facilitate the implementation of the FAIR principles and learn from their experience. 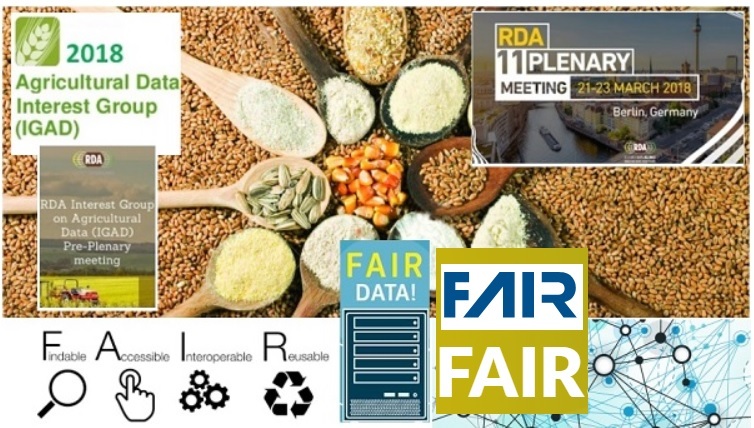 will be dedicated to the theme “The FAIR principles to all elements of the research process in agricultural sciences and related disciplines” with a keynote FAIR: Establishing of a social and technological infrastructure for data discovery and reuse by Dr. Michel Dumontier (Distinguished Professor of Data Science at the Maastricht University, Netherlands) and a series of presentations dedicated to the FAIR principles in relation to Institutional Use Cases, Semantics and Data Models and Implementation in Research Infrastructures. You can find more details about the meeting at the Agenda and also information about How to get to the venue. Leanne Wiseman (Griffith University, Australia). You will find more detailed information at Agenda. From 16:30 to 18:00 (at the same time! ), IGAD has been invited to participate at the panel session on BoF Connecting the pieces: coordinating communities and combining recommendations to explore the experiences, lessons learned, and future plans of four groups within RDA working to coordinate interdisciplinary work and combine multiple RDA Recommendations into working systems and functional infrastructure. 2.) A new Earth and space sciences-oriented adoption project led by the American Geophysical Union, which is working to implement multiple RDA (and related) recommendations across publishers, repositories, and infrastructure providers to improve scholarly communication. This involves multiple RDA groups, but especially the data publishing and related IGs. 4.) the Disciplinary Collaboration Framework IG is trying to coordinate disciplinary activity within RDA and articulate a clear and consistent narrative on how they expect cross-cutting RDA groups to prioritize their work. You will find more information at BoF Connecting the pieces: coordinating communities and combining recommendations. From 11:00 to 12:30, the WG Agricsemantics has organized a working session on Agrisemantics: Towards Recommendations for the Future of Agriculture e-Infrastructures. The objectives of the meeting are to present and discuss analysis of use cases and requirements for final output of group and to plan final phase of group activity. Just as a reminder the RDA Agrisemantics WG aims at serving as a community-driven initiative to advance on a shared view on the role of semantics for data sharing and interoperability, especially for data related to agriculture. Boniface O Akuku (Kenya Agricultural & Livestock Research Organization). You will find more information at Supporting effective engagement with research & open data in the agriculture and nutrition. Lessons from IGAD & GODAN Action. What does it mean to make data FAIR? What have other IG/WGs produced to date that address FAIR? We hope that you will enjoy the discussion in all these sessions! Your feedback will be important! The IGAD co-chairs would like to express their gratitude for the support that IGAD and WGs have received from the Global Open Data for Agriculture and Nutrition (GODAN), the French National Institute for Agricultural Research (INRA) and Food and Agriculture Organization (FAO) of the United Nations to organize these series of events!